“What’s this, Mama?” my oldest daughter asked. She held out a lavishly illustrated fairy tale we’d just gotten from the library. “You want me to read it?” I asked. “Yeah!” she said, jumping up and down. She settled into my lap and I opened to the first page. None of this was at all atypical. Except my heart was beating fast. Because the book was a retelling of A Midsummer Night’s Dream. And I had stumbled across it by accident in the library. It’s probably over her head, I thought, but I set it in the front of our library book basket, wondering if she’d bite. She did all right. In spades. 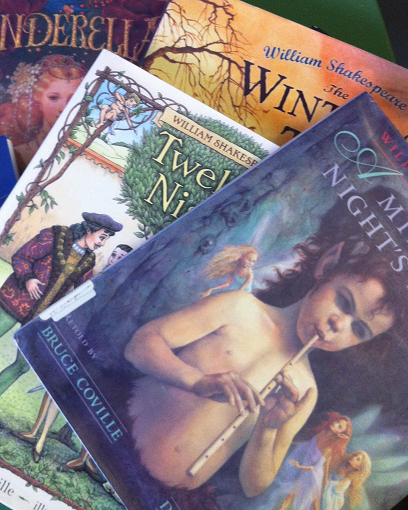 Over the next few weeks, we read and re-read Midsummer. We wove the stories into our oral bedtime tales, I dressed her in fairy wings as she was Cobweb or Mustard Seed or Titania, the Queen of the Fairies herself. We watched a ballet version, and then a movie adaptation. And then I felt a surge of anger. Because nothing about our experience with Shakespeare had been “geeky.” And thinking about it that way seemed like a betrayal. I’m a novice unschooler, my oldest just finishing kindergarten. I’m still figuring out how to do our learning. And our experience keeps surprising me. One big surprise? How freeing it is to me personally to experience learning in a new way. I was a good student in school, but sometimes, socially, that worked against me. Liking school subjects too much, being engrossed in them, reading books above grade level—all of that was suspect. In high school I became a Christian, and started hanging out with the Christians, which happened to move me “up” a rung, socially. I stopped eating lunch with the science-lovers and drama geeks. I still counted them as friends, but usually watched them from afar. One lunchtime, I remember watching my old buddies set up an elaborate picnic, with patterned sarongs, a few lawn chairs, cushions, plates. Someone must have packed the accoutrements in their car ahead of time. They reclined, passed platters. I smiled, a little envious of their audacity. But I didn’t cross the lawn to join the fun. I’m older now; I don’t care who knows I like reading books and writing. But I find the habits I formed in school run deep. I’m tentative about so many things. I’m not about to set up a Elizabethan feast in full view of snarky peers. I was an English major and loved reading books deeply, studying them not just to learn the plot, but ask questions about why the book was structured just so, how the author had achieved her ends. Recently, I started asking: why not do that even when I don’t have a class to study for? I got nature field guides for my daughters, and realized I could use them myself to learn about the trees that had always been anonymous to me. I’ve always thought of myself as someone that doesn’t know much about nature. Recently, I started wondering: why not change that? I’m reconsidering skills that people usually acquire in childhood—swimming, say, or basic math. What if I approached them as a learner, not because my kids need to know them, but because they are intrinsically interesting. I see how much of the world I have shut myself off from. Sure, I have limited time to explore new subjects now. But it’s not so much that I need to do all these things immediately, but that as my daughters see the world, I’m realizing we’ll discover it together. The world is seeming more alive, more deep, more imbued with God’s delight. Which brings me back to Shakespeare. As an adult, I’ve seen a few live plays, watched a few movies for pleasure, but in general, I’ve approached the Bard on an intellectual level. He’s someone to be read, to feel a little intimidated by, a lofty peak to scale. But my daughters aren’t intimidated. They don’t get all of it, but they don’t care. Shakespeare doesn’t seem that different to them than the Disney Princesses, or the Narnia books, or the dog-eared copy of Aesop’s fables with its talking lions and crafty foxes. It’s all Story, it’s all play, it’s all magic. I see the wonder God has put into them growing day by day. I see them go further in to that wonder and excitement. And with a growing delight, I’m realizing I can join the party.